Office of the Governor photo. The fairgrounds have reportedly remained essentially the same for a century, with no major redesign and investments made only for basic rehabilitation such as repairs of roofing systems, electrical systems, water and sewer mains and roadways. The overall plan includes removing the grandstand and motor track to make room for new facilities; enlarging and upgrading the Midway to facilitate a more robust carnival; performing infrastructure upgrades to enhance visitor experience and better showcase a variety of attractions; and creating a new, 400 site RV Park to serve the Fair, the Lakeview Amphitheater, and many large events held at the fairgrounds year-round. 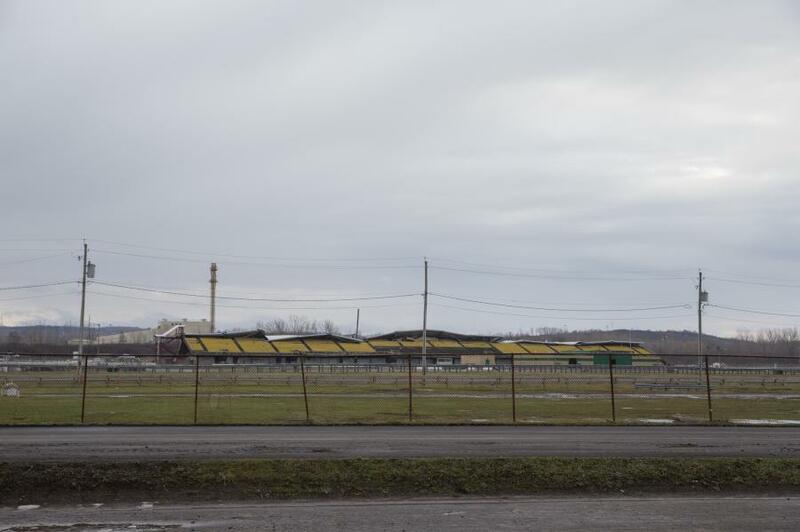 The fairgrounds have reportedly remained essentially the same for a century, with no major redesign and investments made only for basic rehabilitation such as repairs of roofing systems, electrical systems, water and sewer mains and roadways. 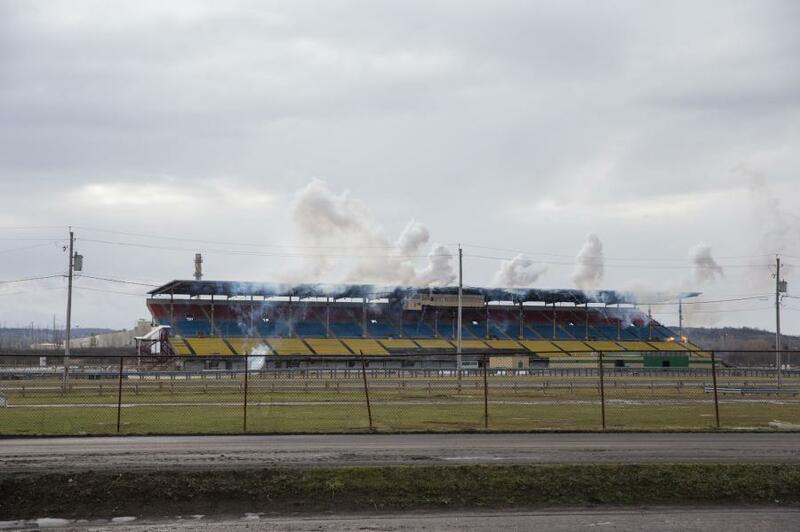 According to Dave Bullard, public relations officer of the fair, the demolition of the existing grandstand, foundations, racetrack, ancillary buildings and utilities is complete. The contract for the demolition was awarded to Controlled Demolition Incorporated (CDI) for $230,100.00. The explosives used were linear shaped charges, gelatin dynamite and non-electric detonators. A total of 268 explosives were used for the implosion. In addition to CDI, Total Wrecking and Environmental LLC (TWE) was retained as the prime demolition contractor. TWE was responsible for abatement and general debris removal prior to and following the implosion. 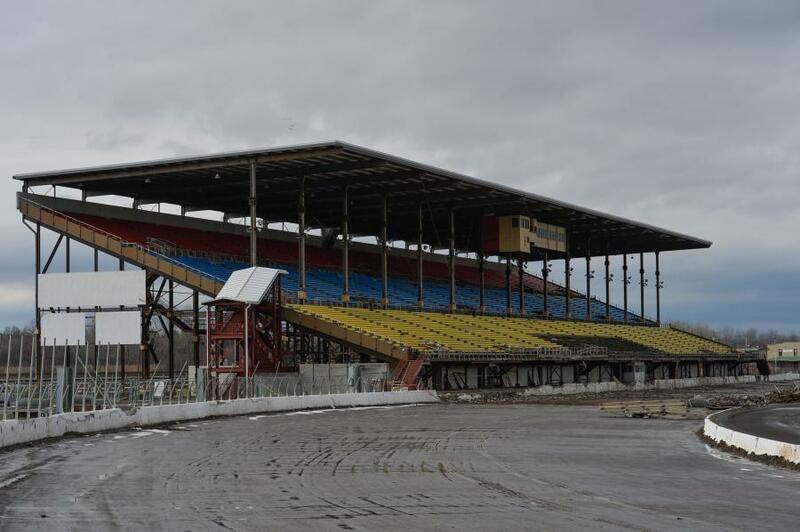 The existing grandstand was originally constructed in 1972, was not designed to function as an outdoor concert venue, and was not equipped to meet the needs of modern acts. In fact, officials noted that the outdated nature of the grandstand hindered efforts to book top acts to play during the fair, and the grandstand itself had become a money-losing operation. Since the Onondaga County's Lakeview Amphitheater opened in close proximity to the fairgrounds, the region has a venue capable of hosting large concerts. The removal of the outdated grandstand will free up space for fairground enhancements, and large paid-attendance concerts during future runs of the fair will be located at the Lakeview Amphitheater. The motor track is currently only utilized once per year for the annual Super DIRT Week. Like the grandstand, removing the motor track also will create room for crucial enhancements and modern facilities that can be used for a wider variety of events, year-round. To ensure the continued success of Super DIRT Week, the Governor announced that the state has entered into a 10-year partnership with the event organizers allowing them to remain in Central New York. The state also will invest $250,000 in promotional dollars to assist Super DIRT Week expand and grow over the next five years. Currently, the Governor noted that the Midway's odd shape does not allow for the optimal placement of rides and games during the fair, which limits the space available to debut new attractions. In addition, a lack of utility services and a proper draining system impedes the space's ability to function as a show venue outside of the fair's normal two-week span. Under the Governor's plan, the Midway will be expanded from 12.5 acres to nearly 16 acres and reoriented as the epicenter of the fairgrounds. Full infrastructure upgrades also will take place, including the installation of properly sized sanitation and storm water systems, electrical and communication systems, and electric/water/sewer hook-ups for concession booths, rides, and campers. During non-fair times, the new Midway also will allow for more organized parking for events, a larger space for outdoor shows, and an expanded camping area that will allow for large rallies and camping shows. 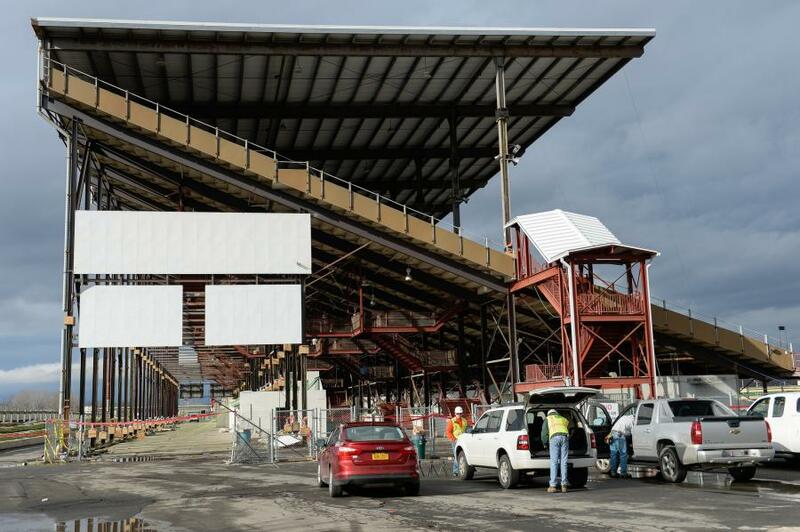 Completion of the Midway enhancement is expected in July of 2016 at a construction cost of $2.5 million. In addition, the existing entrance gate at the fairgrounds' front entrance has been demolished and removed. Foundations for the new entrance's columns are formed and concrete has been poured, according to Bullard. Structural steel is scheduled to commence mid-April, followed by the installation in May of the glass fiber reinforced concrete and the precast columns. 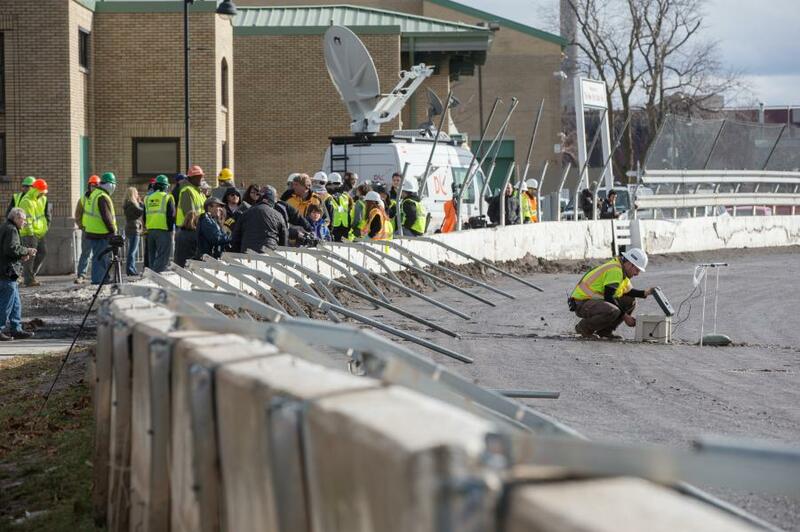 The front gate will be reconstructed in a way that is reminiscent of the original, historic Fairgrounds gate while also being ADA compliant and supportive of modern event needs. The gate was redesigned to be visually pleasing, with new streetscapes, seating, shade, and other visitor amenities. Additional improvements will allow for the creation of the “New York Experience” — a functional, park-like area that will highlight the past and future of New York State from perspectives that include its economic, cultural and historical significance. Bullard noted that the grading of the New York Experience water feature is currently in progress. Completion of these improvements is expected in July of 2016, at a construction cost of $7.7 million. The Governor's plan also includes the creation of a new, 400-site RV Park. This will include full camper hook-ups with 50/30/20 amp electric options, the infrastructure to support communications/fiber, water and sewer connections, as well as bathrooms and showers. Security improvements will include a full camera system and a blue light system in select locations. Completion of the new RV Park is expected in July of 2016 at a construction cost of $3.8 million. The original plan also included a new expo center and festival stage. However, these two projects were removed to allow funding to be spent elsewhere in the updgrades.